In a reunion that’s not been this touching since Dumbo found his mum, after a five year hiatus Rugby Union club Sale Sharks announced today that we’re their new sponsor! It’s the largest sponsorship deal in the history of the club and means great things for the Sharks and for UKFast too! If this seems a little ‘leftfield’ to you (because rugby), here’s why we’re better together. Yes, it’s no ordinary Tuesday today – we’re officially the new sponsor for the Sharks, and it’s a pretty big deal for a few reasons. We sponsored the club from 2000 to 2010 and, after five years apart, we’re back to support the team as they prepare to compete for the European Champions Cup this season after finishing sixth in the Aviva Premiership. As you know we’re big fans of supporting talent in Manchester, and these are exactly the kind of relationships that will help our city’s top sporting clubs to become world leaders in their fields, leading the city to greatness and constantly pushing for better, which is something we’re big fans of in our work lives too. 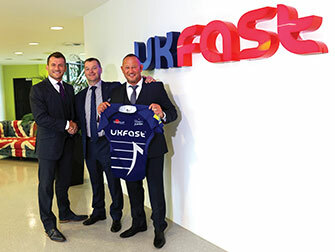 During our time with the Sale Sharks, UKFast’s sponsorship was instrumental in growing the fan base at Edgeley Park to more than 10,000, alongside Nathan Bombrys, who’s now Managing Director of Glasgow Warriors, so we’re expecting big things this time around too. So, prepare to get excited as the Sharks tackle their next challenges with UKFast at their side. You’ll probably be seeing our branding on their shirts and our team on the side-lines cheering them on – we hope to see you there too! Get the full scoop on the new deal and the exciting changes happening through the partnership on our press releases web page.